In twenty-three challenging and inspirational chapters you will discover lives that define what is best – and what is not – in the human experience. Without a doubt, you will be stirred by the extraordinary lessons from otherwise ordinary people! You will be encouraged and motivated, and you’ll want to make their choices your own. And if you do… your life may one day be a Profile in Character. Was $19.95. 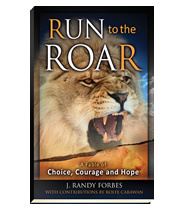 The newly reduced price is $17.95. He was one of the most influential Americans that ever lived. Benjamin Franklin’s success as a statesman, inventor, scientist, millionaire, and signer of the Declaration of Independence is legendary. What enabled this man to achieve such distinction? Early in life Franklin discovered a comprehensive strategy that provides the means for anyone to achieve success and happiness. He determined to write a book to reveal this strategy, but regrettably “The Art of Virtue” was never written. Now with refreshing insights and pointed anecdotes, The Character Revolution seeks to disclose Franklin’s timeless truths and principles – truths that are as relevant and instructive today as they were two hundred years ago. Only $14.95. No matter where you’re from, where you’re going, or why you’re reading this book, constant change and increasing uncertainty will very likely characterize the world as you know it. As the need for fearlessness increases, it is far too easy to hide in the crowd – hoping that someone or something else will rescue us from the surrounding chaos. Far too many of us are hunkering down and determined to “wait it out” rather than taking bold action and facing- head on- whatever has rendered us afraid, anxious, and paralyzed.